The sailing ship Tory dropped anchor in Queen Charlotte Sound to pick up fresh water, food and timber before proceeding to Port Nicholson (Wellington Harbour). 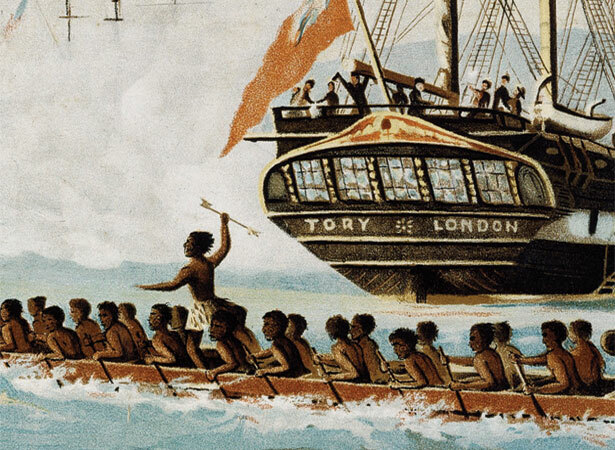 On board were representatives of the New Zealand Company, sent to smooth the way for organised settlement. Their objectives were to purchase land, acquire information about the country, and prepare settlements for the emigrants the Company was recruiting. Led by Colonel William Wakefield, brother of the Company’s leading figure, Edward Gibbon Wakefield, the party also included his nephew, Edward Jerningham Wakefield, naturalist Ernst Dieffenbach, draughtsman Charles Heaphy and interpreter Nahiti, a young Māori who had been conned by a whaling captain into working his passage to France. Dr John Dorset was ‘Colonial Surgeon’ and Captain E.M. Chaffers was the ship’s master. The Tory reached New Zealand in just 96 days. Speed was important as the New Zealand Company intended to despatch settlers to New Zealand before receiving confirmation that the initial expedition had been successful. The first migrant ship, the Aurora, would arrive in Wellington Harbour in January 1840 (see 22 January). We have 8 biographies, 3 articles, related to New Zealand Company ship Tory arrives .